Q: How deep can Utilivac dig? A: Utilivac has successfully excavated holes as deep as 26′. Standard air knife extensions are available up to 21′, with longer custom sizes also available. Q: How fast can Utilivac dig a 4' deep hole for a utility locate (pothole)? A: About five minutes of dig time is typical. In very hard or frozen soil it might take a few minutes longer. The most important thing to consider when thinking about productivity is that the actual dig time is only part of the equation. The total time to complete a pothole also includes the time it takes to secure the job site, get the vacuum in place and ready, do the excavation, backfill the hole, and move to the next location. The Utilivac system was designed for efficiency at every step of the process. Having the Utilivac next to the pothole keeps the pick-up hose as short as possible, greatly reducing time wasting clogs, and backfilling is fast because the material stays next to the hole. Since you can use Utilivac anywhere you can run compressed air hoses, you can park you support vehicle and compressor in a safe place (and avoid lane closures) then dig every hole you can reach with your air lines without moving the truck. That provides significant increases in daily production versus truck mounted units. Having the Utilivac next to the pothole keeps pick up hose as short as possible greatly reducing time wasting clogging. Q: Does Utilivac work in frozen soil and hardpan? A: Yes. This is where our unique air knife nozzle design really shines. Our air knife has the ability to “bore” into, and break up even the hardest soils without damaging utilities. No need to resort to messy high pressure water jets. A: Utilivac is designed to run from a standard 185 CFM air compressor set to between 100 and 120 PSI. Utilivac will not operate correctly with a compressor smaller than 185 CFM. Q: Can I use a compressor larger than 185 CFM? A: Sure. Many Utilivac owners use 210-250 CFM units. However, bigger compressors do not increase the power of the system and using a larger compressor will not damage the unit. Q: Do you make a towable system? A: Yes. We can build you a complete system including the compressor, hose reels, and mounting points for the Utilivac. This is a great option when you are going to be using Utilivac on a daily basis. Some of our customers who only occasionally use vacuum excavation just rent compressors as needed, and some customers use truck mounted compressors. Q: Can I fill 55 gallon drums with Utilivac? A: Yes. The Utilivac cyclonic separator head fits directly onto standard 55 gallon drums. Q: What happens if I accidentally over fill the Utilivac hopper, will that damage the vacuum pump? A: No. The Utilivac pump has no moving parts and was designed to tolerate material passing through it should the hopper be overfilled. However it is best to avoid that situation because the material will be ejected from the pump at high speed. For this reason, never operate the Utilivac without a catch bag secured to the exhaust end of the vacuum pump. Q: How do I use Utilivac as a water pump? 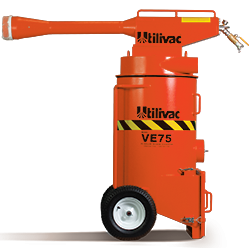 A: The Utilivac hopper is equipped with a 6″ port. Attach a 6″ PVC ‘back-water’ check valve to this port to eject water as the pump is cycled on and off. Utilivac can pump 300 GPM and lift water over twenty vertical feet. Care must be taken because it only takes about 15 seconds to fill the hopper with water, so it’s best done by two persons, one to handle the vacuum hose and one to cycle the pump on and off as the hopper fills. Q: Can I use vacuum hose smaller than 4"? A: Yes. For some applications you may want to use smaller diameter hose, although for excavation uses it’s best to stick with 4″ to avoid clogging. Q: Do you make a system with a larger capacity hopper? A: We have made custom collection tanks up to 400 gallons for certain applications. For general excavation, the 75 gallon size is ideal since a larger hopper would become too heavy to move by hand, and make the system less portable. When exposing utilities (potholing) you will seldom if ever fill the 75 gallon hopper unless you have to dig more than 10′ deep. Q: I need another Utilivac for a large project, do you have short term rentals? A: Yes, we have rental units. Contact the factory for availability.